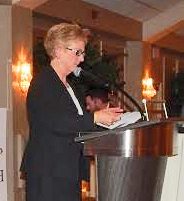 Bunny Dugan speaks after accepting the top award of the nonprofit Pennsylvanians for Human Life on Feb. 28. When the issue of human life comes up in Catholic circles, the focus often seems to be on birth and pre-birth, especially around abortion. But human life is a continuum with its most dramatic moments being birth and death. Pennsylvanians for Human Life, a group that focuses on education on life issues, is mostly known for educational school programs that stress the value of the unborn. At the group’s annual dinner, held this year at the Springfield Country Club on Feb. 28, the entire programmed centered on end-of-life issues. Bernadette “Bunny” Dugan, who is a certified palliative care nurse, was a co-recipient of the group’s annual Margaret Way Hoffner Award, along with Deacon John Travalene, M.D., a professor of medicine at the Lewis Katz School of Medicine at Temple University. Dugan’s task is to be with and see to the needs of the patient and the family during the final stages of life. In the past, she also through Pennsylvanians for Human Life has addressed high school students on end-of-life issues. A resident of St. Anne Parish in Port Richmond her entire life, Dugan and her husband, Dan have raised four children – Brian, Sean, Maureen and Timothy. She was still Bunny Lanahan when she entered nursing school at the former Philadelphia General Hospital after her 1973 graduation from John W. Hallahan Catholic Girls’ High School. Philly General had one of the finest reputations in the city for medical training. It served a mostly poor population and its medical staff encountered just about every type of illness or emergency one could find. After graduation Dugan stayed on as an emergency room nurse. The death of her own father in 1990 was the catalyst for her eventually entering the hospice field. He’d been diagnosed with cancer for two years when he took a sudden turn for the worse and was placed on home hospice, where care focuses on making the patient comfortable, because there is no reasonable chance for a cure. Her father lived only one day on hospice but it was a revelation to Dugan. Two years after her father’s death she joined a hospice care program through the Fox Chase Cancer Center and remained there until the center closed its hospice program. Now she coordinates hospice care for patients who leave the hospital and if they are dying and too sick to leave, she personally serves as their hospice nurse in the hospital. Generally speaking patients are only placed in hospice care if they have been diagnosed with less than six months to live, but in Dugan’s experience they rarely live that long. The typical time is more likely days or weeks, not months. Home hospice is preferred, because “nobody wants to die in a hospital,” Dugan said. A daily communicant, she believes hospice work is a vocation, not a job. “I absolutely believe God is preparing a place for us,” and hospice care is all about comfort care, quality of life and engaging both the patient and the family in ongoing discussions. If the patient or family has no religion to call upon she tells them, “Well, you have spirit.” Hospice is all about body, mind and spirit. Maybe hospice work isn’t something everyone can do, dealing every day with patients who are expected to die very shortly. A well deserved award, Bunny. Church Ministries at St. Charles.